The grounds of the Kenosha County Historical Society in Wisconsin consists of four different exhibition galleries within two buildings, as well as a facility for archives, staff offices, and a gift shop. Housed inside the Kenosha History Centers are three of the exhibition galleries, the Archives, main offices, and the center’s gift shop. The historical society’s other building is the Southport Light Station, situated next to the Kenosha History Center, which houses the fourth exhibit gallery. The purpose of the Kenosha History Center is the collection and preservation of artifacts, information, and records critical to the knowledge and understanding of the history of Kenosha County’s industrial, ethnic, cultural, and social heritage since the time of its settlement. The History Center utilizes these artifacts and materials to share the knowledge of the Country, whether by acting on their own or collaborating with other organizations and individuals. 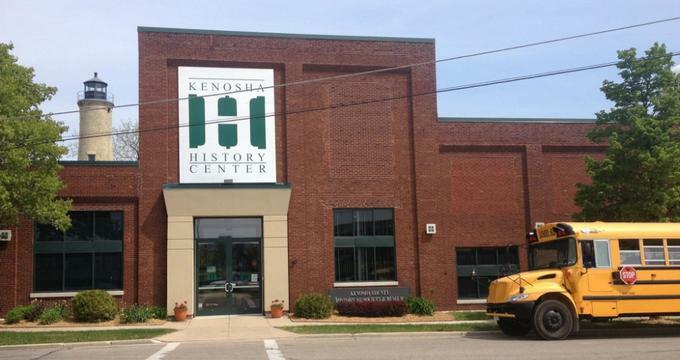 The Kenosha History Center spreads the knowledge they collect of the history of the local area through its exhibits in the museum, research, outreach programs, and historic sites for the benefit of its visitors and the local community. The Kenosha History Center houses three exhibit galleries that share the local history of Kenosha County. The Lyman Gallery is actually the lobby area of the center. Located within the foyer of the entrance is a display case that showcases local businesses of Kenosha Country that have existed for at least a century. Displays that have been on exhibit have included Gottfredson and Nicoll Jewelry Stores, American Brass, Snap-on, Hansen Funeral Home, and Andreas Gift Shop. Additional exhibits are displayed throughout the lobby area. The lobby also contains a clothing store, toy shop, housewares stores, and photography studio as part of its period displays. The Yesteryear Gallery at the Kenosha History Center highlights the story of the county’s early beginnings. As visitors enter the Yesteryear Gallery, the oxcart of the Upson family is the dream of the storyteller. This oxcart traveled from the state of Connecticut to the territory at the time of Wisconsin by ship and by barge. Visitors are encouraged to imagine the challenges a settler family faced on their journey, as well as the opportunities that awaited them. Agriculture became vital to supporting the quickly growing community as more settlers arrived in the area of Kenosha County. The collections at the Kenosha History Center date back over a large period of time, featuring items that were used during the early settlement of the area, such as an early tin lantern up to a telephone from the twentieth century. Residents of Kenosha County bought an array of merchandise and goods from the year 1835 to the year 1910, allowing the HIstory Center to showcase a broad selection of items over a wide range of time. A display of a General Store, which was a crucial community fixture and became an institution of America, is one of the highlights of the Yesteryear Gallery. The gallery also features a railroad ticket office, an apothecary, and other businesses of the past.